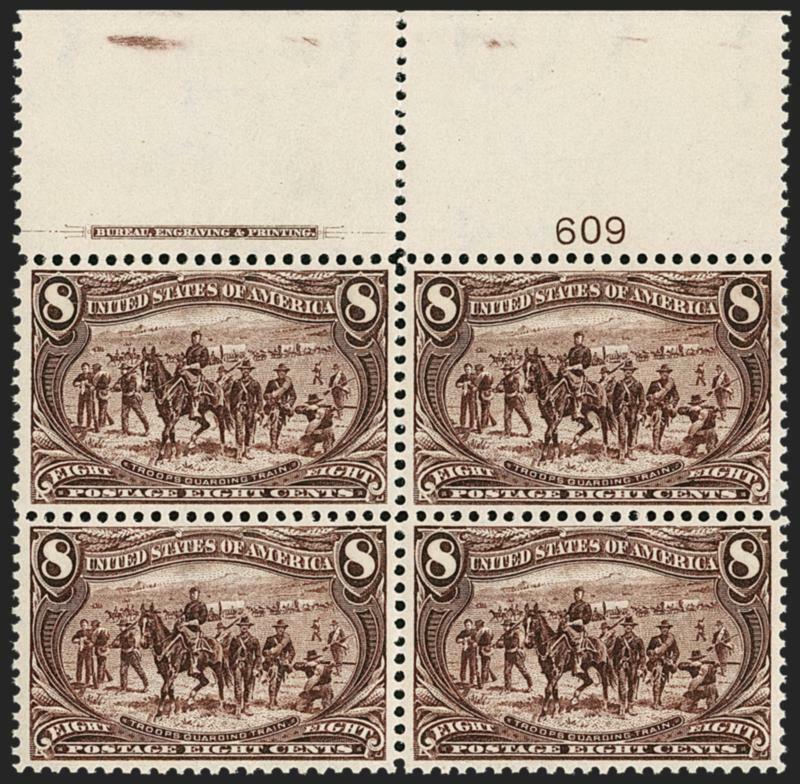 The full imprint and plate number is contained within the selvage adjoining two stamps of the Trans-Mississippi Issue, so generations of collectors saved this issue in plate blocks of four, not six. 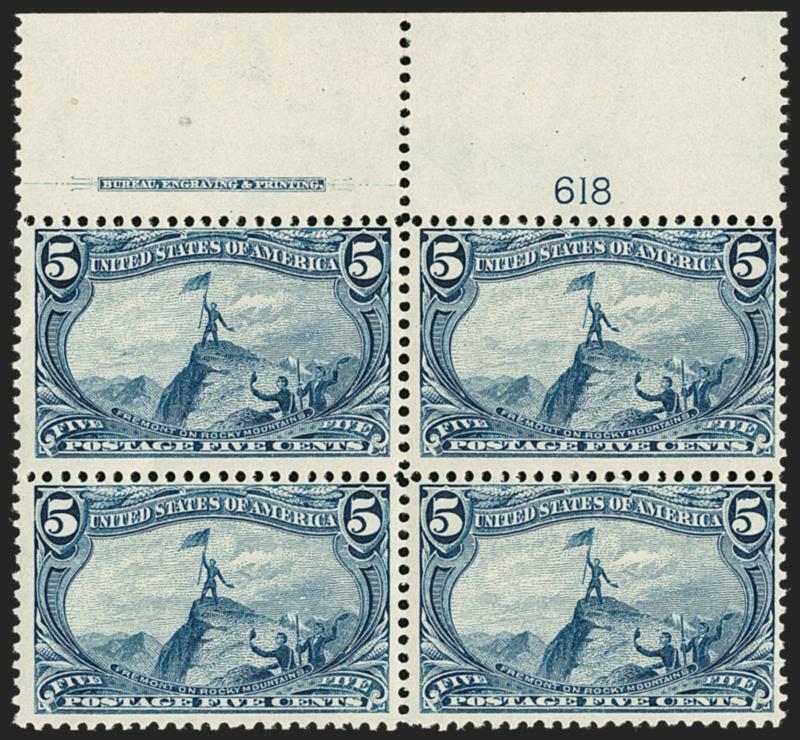 We have never offered a Mint N.H. plate block of six from the top position since keeping computerized records. We have offered only one plate block of six from the bottom position, in 1999. Lilly owned a top left corner plate block of ten, and a few full panes are also known. 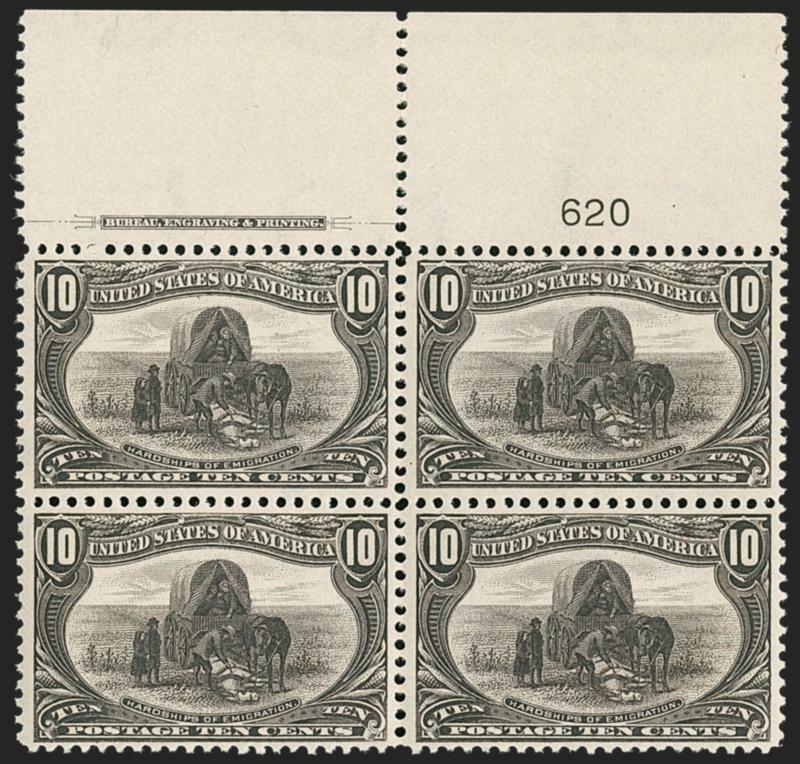 Bureau of Engraving and Printing (BEP) plate proofs of the 1898 Trans-Mississippi Issue (or of any BEP commemorative issue) should not be confused with the more readily available 1893 Columbian plate proofs, which were printed by a private bank note company. The Trans-Mississippi plate proofs are great rarities. In fact, of the nine denominations, only the 2¢ and $2.00 Trans-Mississippi are found in plate proof form outside government archives--both are on card (no India paper proofs are known). We do not know of any other BEP commemorative plate proofs in private hands. 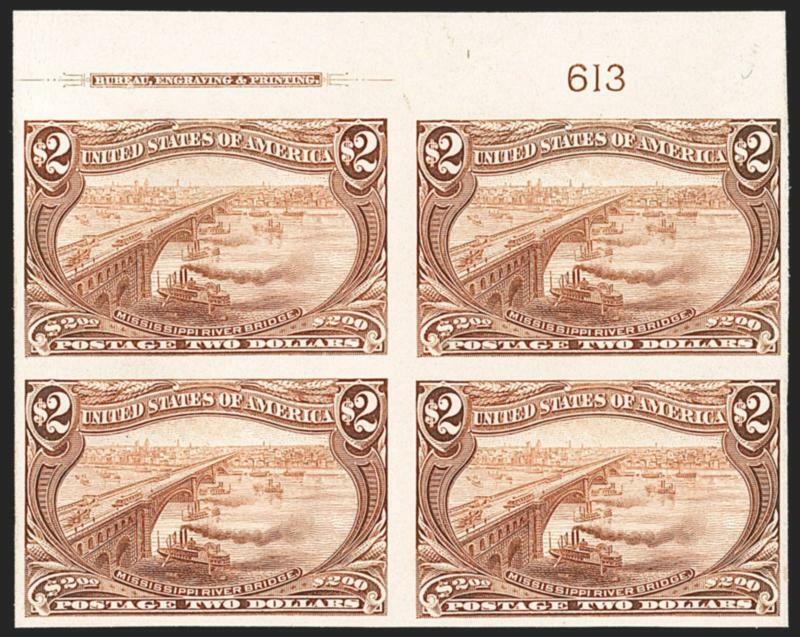 The only source of the $2.00 Trans-Mississippi plate proofs is a vertical block of six with imprint and plate number, sold in Part 17 of the Colonel Green sales (Harmer, Rooke & Co., 11/13-18/1944). The description notes "In the almost 50 years since the Bureau issued this stamp no plate proofs have ever been recorded, a magnificent item and of course unique." Shortly after the Green sale, the bottom pair was removed. 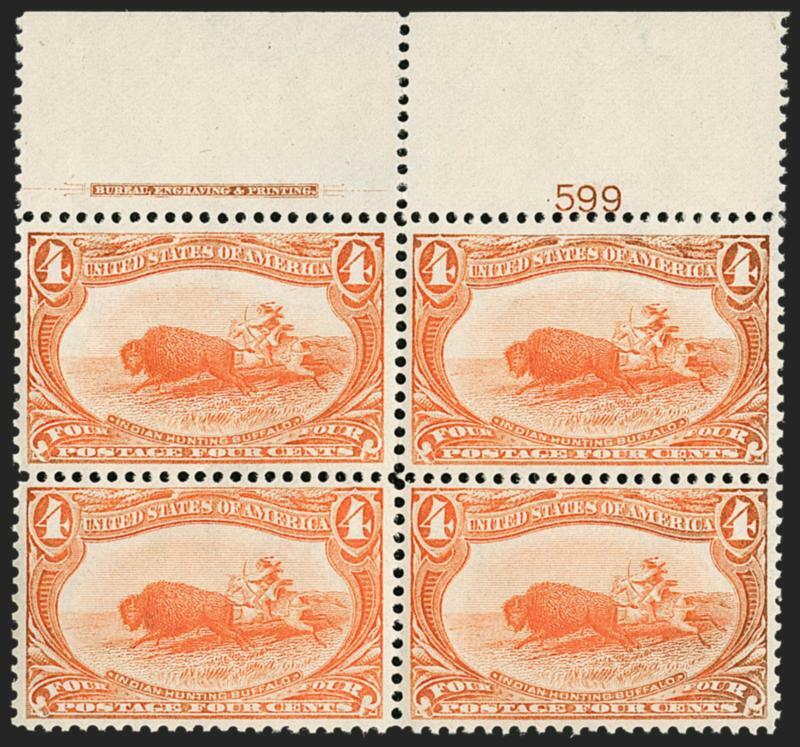 The block was offered in a Harmer, Rooke sale (10/9-11/1956, lot 149), and the pair appeared in one of our auctions decades later (Sale 564, 6/12-13/1980). We have been unable to locate any other examples.